An Anguillan baby with health professionals. 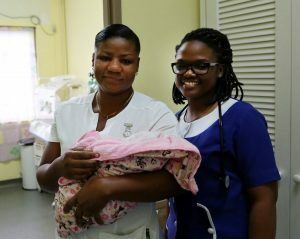 “This elimination is the result of our strong political commitment to public health and of making the health of mothers, children and families a regional priority,” said Timothy Harris, Prime Minister of St. Kitts and Nevis. Over the last six years the Caribbean has succeeded in reducing new HIV infections in children by more than half. “This is an amazing achievement given the high rates of HIV in the past, and we intend to improve on this success story even more in the future,” Harris is quoted in a statement issued by the Pan-American Health Organisation/ World Health Organisation (PAHO/WHO). 310 000 [280 000–350 000] people living with HIV. 64% [51–74%] of people living with HIV know their status. 81% [64– >85%] of people diagnosed with HIV on antiretroviral therapy. 67% [53–77%] of people on antiretroviral therapy have a suppressed viral load. 18 000 [15 000–22 000] new HIV infections. 9400 [7300–12 000] AIDS-related deaths. 25 million live births in 2014 in 31 Caribbean countries. 10 000 [8700–12 000] children up to 14 years of age living with HIV, 29% less than in 2010. <1000 [<1000–1000] new HIV infections among children up to 14 years old in 2016, more than 52% less than in 2010. 11 000 [9000–13 000] new HIV infections prevented among children up to 14 years old from 2010 to 2016. 97% of women attend at least one antenatal check-up, and 94% of deliveries took place in hospitals in 2016. 78% of pregnant women were tested for HIV in 2016, 35% more than in 2010. 74% [65–84%] of pregnant women living with HIV are on antiretroviral therapy, a 64% increase since 2010. 9% rate of mother-to-child transmission of HIV, 52% less than in 2010. 96% coverage of testing for syphilis among pregnant women who had at least one prenatal visit, stable since 2010. 80% of pregnant women diagnosed with syphilis received adequate treatment, stable since 2010. 1 case of congenital syphilis every 10 000 live births in 2016 according to data from 21 countries, stable since 2010.